Listed as Meredith C. Shifferly, but as it was the same address as her parents, it was she. Buyer, C. F. Jackson Co.
Albright was manager of a dry goods store, and Carrie was a clerk in a dry goods store. Pres., Marshall Dry Goods Co.
Dept. Mgr., R. T. Gregg & Co. The minister was Meredith's grandfather, John Todd. The witnesses were her sister, Mary Carolyn Shifferly, and her uncle, James Todd. Click here to view marriage record! He was a salesman, and she worked at the Lima Ordinance Depot. He was an employee at the Ohio State Hospital, and she was a saleswoman at Kresge's. Ed and Meredith after the wedding of her sister, Mary Carolyn to Edward Hall. Wife of Gerald H. Maus and daughter of Albright and Carrie Todd Shifferly. [S417] 1910 United States Federal Census, Ottawa Twn, Allen County, Ohio ED 24 Page 8A Dwelling 168. [S415] 1920 United States Federal Census, Marietta, Washington, OH ED 199 Sheet 6B. [S86] ua, Lima, Ohio, City Directory, 1924, Page 311. [S86] ua, Findlay, Ohio, City Directory, 1927, Page 124. [S86] ua, Lima, Ohio, City Directory, 1928 Page 531. [S91] Gravestone, Clymer Cemetery, Bluffton, OH. [S311] The Hauenstein & Schifferly Families of Ohio, p. 299. 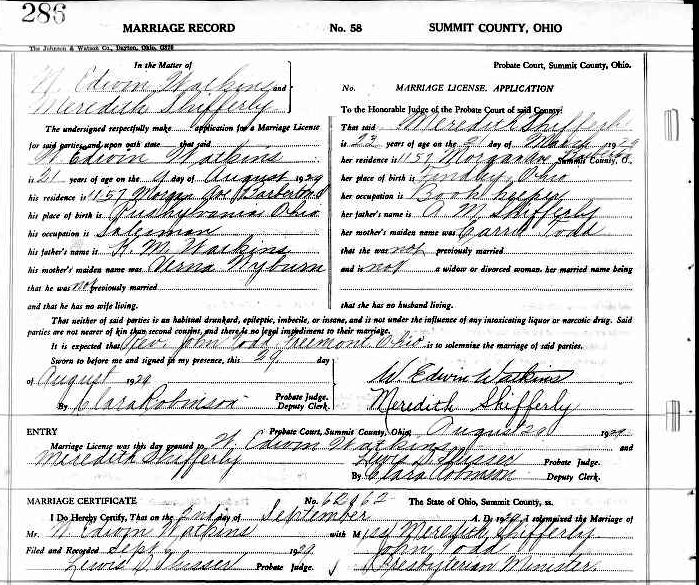 [S93] Marriage Certificate, Vol K Pg 334 No 2778, Allen County, OH. [S86] ua, Barberton, Summit County, Ohio ED 158 Pg 22A Dwelling 616. [S86] ua, U.S. City Directories, 1821-1989, Akron, Ohio, City Directory, 1931, page 1774. [S449] 1940 United States Census, 1940 United States Census., Bellefontaine, Logan, Ohio, ED 46-13, Page 15A, Dwelling 412. [S449] 1940 United States Census, 1940 United States Census., Mt Cory, Hancock, Ohio, ED 32-39, Page 1B, Dwelling 17. [S86] ua, U.S. City Directories, 1821-1989, Lima, Ohio, City Directory, 1942, Page 122. Certificate of Marriage, The State of Ohio, Summit County, ss. [S449] 1940 United States Census, 1940 United States Census., Springfield, Ward 7, Hampden, Massachusetts ED 22-143, Page 1A Dwelling 9. [S86] ua, Springfield, Massachusetts City Directory, 1941, Page 648. [S88] Commonwealth of Mass., Probate Court. [S86] ua, U.S. City Directories, 1821-1989, Lima, Ohio, City Directory, 1946, Page 228. [S86] ua, U.S. City Directories, 1821-1989, Lima, Ohio, City Directory, 1949, Page 131. [S86] ua, U.S. City Directories, 1821-1989, Lima, Ohio, City Directory, 1955, Page 144. [S86] ua, U.S. City Directories, 1821-1989, Lima, Ohio, City Directory, 1960, Page 217.